The University of Texas at San Antonio has competed in the concrete canoe competition since 1989. In the 20 years we have participated, we have brought home several 1st place victories. This year the Texas/Mexico Regional Concrete Canoe Competition will be held along with the Texas/Mexico Steel Bridge Competition in Spring 2016 at Texas Section ASCE Convention. 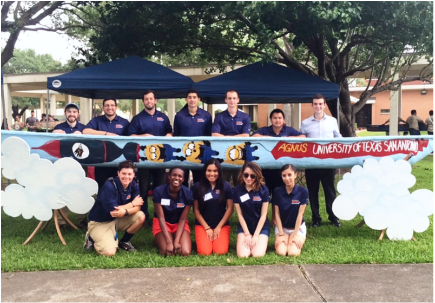 Concrete Canoe is a great way to get involved in ASCE and to meet other students who share an interest in civil engineering. The hull and mix design as well as the fabrication technique is done by UTSA civil engineering students. The construction of the canoe takes place in the concrete lab on the west side of campus. All ASCE-UTSA members are welcome to participate. It is a great way for juniors and seniors to work alongside freshman and sophomores and test their knowledge and skills acquired in the classroom.